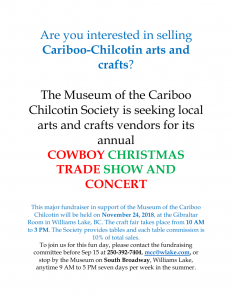 On September 19 at 7 PM at City Hall (450 Mart St. Williams Lake, BC) the Museum of the Cariboo Chilcotin Society is hosting a special membership meeting to ratify the transition to the New Societies Act of BC. All registered members are invited to attend to assess and confirm the transition. The transitioned constitution and bylaws have been sent electronically to all members and hard copies will be available at the Museum for pick up starting now (Sep 13). The documents will also be available at the meeting. Our hearts go out to the Museu Nacional after the tragic loss of tens of millions of artifacts in a fire. For us in BC right now, it is a moment to be grateful that our heritage and historic institutions stand a safe distance from fires. The importance of digitizing and caring for the collection cannot be overstated, which is why we are working tirelessly to ensure that the artifacts, photographs, and archives are well preserved. 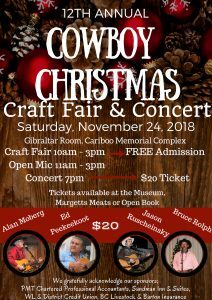 The Museum of the Cariboo Chilcotin Society is excited to announce the return of its annual Cowboy Christmas Craft Fair and Concert for 2018. 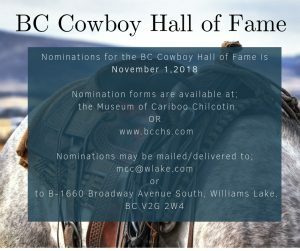 It will take place on November 24th 2018 at the Gibraltar Room in Williams Lake, BC. 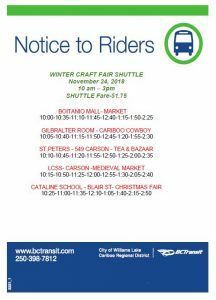 The Society is seeking vendors for the craft fair portion. Table fee is 10% commission. Anyone interested is encouraged to contact the museum who will relay the request to the committee. We are reachable during our regular business hours, 9 AM to 5 PM at 250-392-7404 and mcc@wlake.com. We look forward to hearing from you! 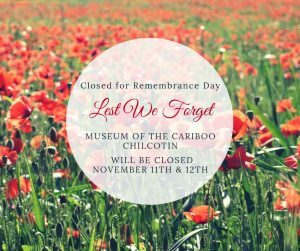 The Museum of the Cariboo Chilcotin is hugely appreciative of the Heritage Legacy Fund for agreeing to support our project entitled “Contextualizing St. Joseph’s Mission” which will begin preparatory work soon.